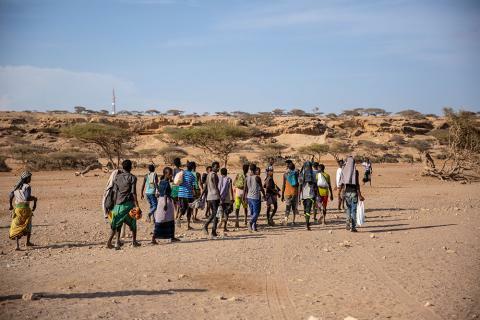 Nairobi – Nearly 400,000 migrant movements were recorded in Djibouti, Ethiopia and Somalia during the first six months of 2018 – an average of 2,000 or more individuals per day. A slim majority (51%) of these individuals are moving from, but also within, the Horn of Africa, followed by about 35 per cent whose movements are towards the Gulf Cooperation Council countries on the eastern route – through Djibouti, Somaliland and Puntland. These and other trends in migrant movements are studied by the Regional Data Hub (RDH) for the EHoA, established at the beginning of 2018. The RDH aims to support evidence-based, strategic and policy-level discussions on migration through a combined set of initiatives that build on IOM’s extensive migration portfolio in the East and Horn of Africa region. This includes establishing a baseline for regional migration flows, increasing information management capacity across countries to strengthen data consolidation, quality control and conducting research on mixed migration to publish timely and relevant reports and trend analyses. The cornerstone of the RDH is the Displacement Tracking Matrix (DTM), used by IOM to regularly track and monitor displacement and population mobility, as well as provide critical information to decision-makers and responders during and in the aftermath of crises, and contribute to a better understanding of population flows. In the EHoA, the DTM is implemented across six countries: Burundi, Djibouti, Ethiopia, Somalia, South Sudan and Uganda. It has the widest coverage of primary data collection on internal displacement and migration in the region.